Nice BA3-A Weather-proof box in gray heavy Duty plastic. Can hold up to two 12V-7Amp. Batteries. Dimensions: 11" x 8 1/4" x 4 1/2". Nice 1 Button 433.92MHz radio-controls with programmable code - 1024 combinations. Cotains DIP switches inside for coding. Nice Moby 5024 Swing Gate Opener (also known as a NICE swing gate operator or NICE swing gate motor) Kit includes 1 Nice Moby 5024 swing gate opener, 1 Nice FLO 1 Channel Remote, 1 Nice RX receiver and 1 Nice Mindy A824 Control Board. Nice Moby 5024 Swing Gate Opener (also known as a NICE swing gate operator or NICE swing gate motor) Kit includes 1 Nice Moby 5024 swing gate operator, 1 Nice Carica board, 1 Nice FLO 1 Channel Remote, 1 Nice RX receiver, 2 Batteries with Nice BA3 weatherproof box and 1 Nice Mindy A824 Control Board. This item is discontinued. Please see model EPMB as a possible alternative. The Nice MOFB photocells are detectors (type D according to EN standard EN 12453) which can be used for automation of gates. They reveal obstacles situated on the optical axis between the transmitter (TX) and receiver (RX). The Nice RobusKit 400, or RB400KCE, is a slide gate opener kit that includes a Nice RB400 gate operator, Nice MOFB photocells, Nice MOSE key switch, MLBT flashing light, ON2 transmitter, and TS signboard. for gates up to 880 LBS. Nice RB600 Slide Gate Opener (also known as a NICE slide gate operator or NICE slide gate motor) Complete Kit for sliding gates weighing up to 1200 lbs or 50 feet with Battery Back-Up. Electromechanical gear motor with Nice BlueBUS technology. This item is NOT AVAILABLE. Please see Nice Robus RB1000 Slide Gate Opener Commercial Duty as a possible replacement. Nice RB600 Slide Gate Opener (also known as a NICE slide gate operator or NICE slide gate motor) Complete Kit for sliding gates weighing up to 1200 lbs or 50 feet. Electromechanical gear motor with Nice BlueBUS technology. The Nice RBA3 Replacement control board is for the Nice RB600 and Robus 1000 (RB1000) gate operators. Nice ROA6 NYLON Rack With Metal Insert. 3.3FT For Nice RO1124, Robo and Robus Kit. Nice ROA8 Metal Rack- 1 meter / 3.3FT. And 2000 Kg. For Nice Commercial Slide Gate Operator Model RB1000. Nice Robuskit400 Slide Gate Opener 110V / 24V DC Package Including Battery Back-Up and Four ROA6 Racks for gates Up To 40' & 725 LBS. The NICE Robuskit400 Slide Gate Opener (also known as a NICE slide gate operator or NICE slide gate motor) 110V / 24V DC Package Including Battery Back-Up and Four ROA6 Racks. The Robuskit400 Can Handle Gates Up To 40' Long And 725 lbs. Quiet! Reliable! Affordable! The NICE Apollo Robuskit400 Slide Gate Opener (also known as a Nice slide gate operator or Nice slide gate motor) 110V / 24V DC Package Including Four ROA6 Racks and Two Transmitters. The Robuskit400 Can Handle Gates Up To 40' Long And 725 lbs. Quiet! Reliable! Affordable! Nice Robuskit400 Commercial/Residential Slide Gate Opener (also known as a NICE slide gate operator or NICE slide gate motor) 110V KIT for gates up to 40' & 725 lbs. Promotion Includes 3 pieces of rack (each 3.2"). The NICE Robuskit400 Slide Gate Opener (also known as a NICE slide gate operator or NICE slide gate motor) 110V / 24V DC Includes One Slide Gate Operator, Transmitter, Receiver, Light, Photo-cell & Battery Backup. The Robuskit400 Can Handle Gates Up To 40' Long And 725 lbs. Quiet! Reliable! Affordable! Model FLO1R Single Channel Rolling Code remote Control Transmitter For Nice Robo. Nice Moby 5024 Swing Gate Opener (also known as a Nice swing gate operator or Nice swing gate motor) Commercial or residential swing gate opener with optional 24VDC battery back-up. 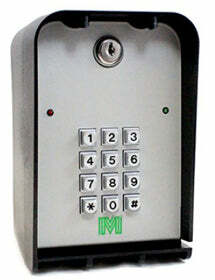 Includes irreversible mechanical stop feature and can handle gate leaf up to 16.5FT. Nice Robuskit 400 Slide Gate Operator 110V / 24V DC Package Including Solar Power Kit and Four ROA6 Racks for gates Up To 40' & 725 LBS. Nice slide gate opener (also known as a Nice slide gate operator or Nice slide gate motor) model Robus RB-1000 is a slide gate opener for sliding gates up to 2200 lbs. The Nice Walky-Kit WL1024 pedestrain gate opener is suited for wood or PVC. Kit includes the Nice Walky-Kit 1024 (WL1024C) with built-in control board, receiver and Nice ON2 Transmitter. Comes with a warning sign. For swing gates up to 6 ft. Compatible for operation with Nice Solemyo Solar Power Kit System and the Nice Opera Management System. The Nice Walky-Kit Pedestrian Gate Opener WL1024 is suited for wood or PVC. Kit includes the Nice Walky-Kit 1024 (WL1024C) with built-in control board, receiver, Nice ON2 Transmitter and Battery Backup. Comes with a warning sign. For swing gates up to 6 ft. Compatible for operation with Nice Solemyo Solar Power Kit System and the Nice Opera Management System. The Hyppo Surface Mounted Swing Gate Opener (also known as a NICE swing gate operator or NICE swing gate motor) handles gates leafs up 9.9 ft. Workable for gates with large pillars. 24VDC Double Limit Switch for opening and closing. Requires Control board #A824. The Nice X-Bar is a solar-compatible barrier gate operator (also known as a Nice barrier gate opener) kit that includes a 24Vdc gear motor,control unit, 10 feet boom, Nice BlueBUS technology and built-in warning light. Compatible for operation with Nice Solemyo Solar Power Kit System and the Nice Opera Management System. The Nice X-Bar is a solar-compatible barrier gate operator (also known as a Nice barrier gate opener) kit that includes a 24Vdc gear motor,control unit, 10 feet boom, Nice BlueBUS technology, built-in warning light and battery backup. Compatible for operation with Nice Solemyo Solar Power Kit System and the Nice Opera Management System.